How do we connect mindful to physical. Jeff talks about how people always think that yoga is about clearing the mind of thoughts, but that isn't true. It is about recognizing your deviant thoughts and then finding an anchor for your attention. Allow those thoughts to happen, but notice them, and then move away from your mind using your breath as a focus point, or anchor for your attention. In swimming, we want to achieve this same goal with our beginner and elite athletes. We want them to focus on a specific skill and improve it while they're swimming. We know as coaches and instructors that people will not be able to do a physical skill perfectly immediately, or every time. So we use tactics like Dominic Latella's Redemption Game to aim that attention for short spurts of time. We want to focus that attention on our intended skill, and meditation is a way to flex that attention muscle. Shivasssana Game: teach a few poses, have everyone do it for a few seconds, then yell, "Shivassana!" and everyone has to lay down and pay attention to three of their breaths. Jeff then gets everyone up and has them pretend like they're trees. While some people are acting like trees, then others are acting like bees and breathing like bee's while moving around the trees. Madness time at the flags and act as rowdy as possible within reason, but then Jeff would yell, "Listening position" and time how long they got back to paying attention. When you're starting your own yoga for swimming a good place to start is in table top pose; hands and knees on ground, raise left hand, and lift right leg straight. Then slowly build on it. Jeff says he could go on for another hour about this one thing, but he distills it down nicely into "Balance." And how it has been fun and full of healthy improvement. Preface: I run safe and encouraging practices. I get along well with my swimmers and their parents. I can't think of a time I was upset with a parent that knew me or has watched a practice. We fill our time building up our swimmers by giving them regular feedback. They experience more than 10 interactions per practice of one of the coaches saying something they did well, and something they need to improve upon. We take particular effort in praising effort as followup to previous instruction. We've been doing "Fail" practices inspired by episode #061 with the Swim Box and Dominic Latella. Here's what we've done, and why you can do it too. Give a chance to do something well. 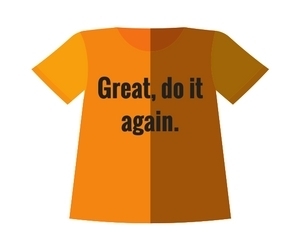 Give specific feedback with a "success" or a "fail" thumb up or down. Have a reward, and a consequence. Make rewards fun, make punishments learning related. Be kind in your delivery. Today is a short podcast about how I failed when taking a child underwater. I went to the beach with my friend and his family and while swimming with their 3 year old, I did the motorboat game, and dunked her to disastrous results. Find out the three things I did wrong! Learn why I made this colossal mistake, and how you can avoid it in your lessons with your swim staff this summer. We want to make swimmers better. I had so much fun talking to Dominic Latella from SwimBox. He said multiple times that making swimmers better is his primary goal. He wants to help people and work with others that share that goal. You can see it shine through everything he says in our conversation. Dive into this episode and share his enthusiasm. Breathing well on land is a demonstration of a good athlete. I don't think you realized it, but you said, "breathing is not fundamental," and I would say, breathing is the foundation of swimming. Swim Easier after just one lesson. SwimBox brings together technology and expertise to give you the best swim lesson experience available. The core of our protocol is injury prevention, and our dream is that everyone know how to swim. We work towards that by providing you with the safest swim lessons you can find. Dominic’s straight to the point scientific approach helps you learn safe and efficient swimming technique. SwimBox's endless pool technology allows him to be able to stop you mid-stroke and make any needed corrections/adjustments. He’ll tell you exactly what needs to be done with your swimming to become more efficient, get faster, and swim injury free. Dominic and I have a great conversation about challenging a core swimming concept: engage your core. Should we be focusing on pulling our belly buttons into their spine? Why did we even start doing that? Functionally, we want to have the core strong and stable to promote the body rotation and the spinal axis being still to maximize the force. But can you maintain a strong core the whole time? Can you squeeze your belly for more than a 50? Maybe we're approaching the result from the wrong way. We talk about how when you use diaphragmatic breathing it fills or expands your waist using the same muscles that you would with "squeezing your core" but you can maintain it for a longer amount of time. Listen to how Dominic talks about learning to breath on land by expanding your pant's waist. He also talks about how you should rest in between breaths, and that you shouldn't start to exhale until your face exits the water. This will have a shallower breath, and because you're doing that, you should breathe to the same side to keep your oxygen at it's optimal level. If you're doing one breath every 3 or 5, you're going to have a deeper breath and a less engaged core as a result. We are getting people stronger in their core through their breath. For beginners, it is better to teach the "exchange of air" and learning that breath is an important part of swimming. I tried this with my developmental swimmers on deck first. We worked on big belly breaths, and small belly breaths. We did exercises where we got close to a mirror and touched the mirror with our belly buttons but not our nose or other body parts using our breath. This was to teach wide waist breathing and using your diaphragm to breath. We talk about how to distill down your feedback and your guidance to building into a better swimmer, or move into the next swim lesson. Dominic talks about how he can take your basic freestyle and in 5 lessons make you a better swimmer overall. In about 3.5 hours, he can give you a series of instruction that cycles through the 5 focus protocols for improved swimming. How do you know which of the many different components of swimming to focus on? 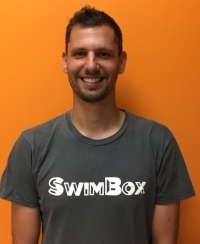 Dominic and his team at SwimBox have come up with lesson plans and what they call "protocols" to teach swimming effectively. I think this echos Swimming Ideas and our level structure for beginning swimmers. We focus on the essential swim skills to get overall better results and improvements in swimming. It is easy to see all the different things that are wrong with the swimmer, but what is the most important thing to focus on first? I really like how Dominic looks at a swimmer and says, "what is going on with the core, and what do I know about improving posture. Let's work on that first, then we can move on to the legs. Dominic and I are of the same mind here. Steal from other coaches and use their language to get the effect. Sometimes we teach and coach and our participants are not responding to our words. Swimming Ideas uses scripts and specific key words to emphasize points, but if they're not working we encourage you to change some of the phrasing. In the same way, we discuss how it totally makes sense to take the words other coaches use to describe an activity in a different way to get your participant to change. USA Swimming sports consultants give coaches the "effective coaching" presentation. Take advantage of this now; it will change your coaching style and life for the better. Remember that when you learn a new motor skill you can only do it for 15-20 seconds. The "redemption game" is basically during your timed swim you get 1 chance to breath wrong, but the next time you breath it needs to be correct, or you lose the game. It ties into meditation because you're training your brain to be aware of your actions, recognize when you don't do it, and then make a change. We use short distance skill training in the pool to achieve the same goals here. Remember that when you learn a new motor skill, you can only maintain doing it for 15 -20 seconds. We do 3 x streamline + [new motor skill] in our swim lesson and our developmental swim team to achieve this exact time limit. We give our swimmers 5 chances in short 10-15 second bursts to do the skill well. In addition, we give immediate feedback to the swimmer right after their attempt. Check out our complete program for more information. The summer is almost upon us and you're going to start running training classes for your summer and seasonal staff. Slap on the sunscreen, wear a floppy hat, and get those kids moving! This is our guide to running effective training sessions. We are going to assume that you are a park district or a large program that has hired a decent sized staff and are running either lifeguard, swim instructor, or all staff training sessions. Your goal is to both create a team and a culture with these people (integrate old and new) and give out a wide range of information that the staff will need to know. Provide information and experience staff needs to do their job. There is a wealth of information about "running a good meeting" and some of the key points are essential for you the manager or the aquatics professional. Remember our two key goals: provide information the staff needs to do their job, and creating a team culture. Those will drive all things, but we'll separate out our guide into three different categories to make things easier for you to plan, execute, and evaluate. When I worked at my outdoor pool over the summers every Friday we had a meeting at 9am. Every week the whole staff got together for an all staff meeting and training session. Before you get in front of your staff the most important thing you need to do should already be done: know what you're going to say and do. Have a plan. Sit down or pull up last year's trainings and review what exactly you're going to accomplish in your meeting and training. Know exactly the things you are going to focus on and distill down to the most basic items what the staff needs to learn, know, or take away from your meeting. Know what you want your staff to take away from the meeting. Know what you are going to do exactly at the meeting to get that result. Prepare any necessary materials or flyers before your meeting to distribute or use as props. I recommend you write up an agenda, or a timeline, or a guide for yourself. Write something down like a list that will keep you on track and provide a guidepost if you take too long on one item or forget something. Introduction, recap of recent week. Any new information that is simple, easy, and relevant to many people. "Today we're going to review CPR, then split into groups and play a few games. Our goal today is getting better at communicating during swim lessons and we're going to focus on that. Then we'll regroup and I have you'll have a chance to ask questions about anything going on this week." Announcement about what you're going to be doing in the training today. Stick to your timetable. If you took too long to setup, allow some time to actually do your activities, but keep things moving. Avoid prolonged tangents or time wasters. We want participation. Remember our goal is to both provide relevant information and training, but to also provide a team building environment so participants feel closer to each other. For CPR you can write up a clear scenario and allow teams to fully act out in a real way as possible the procedures they'd follow to provide care. When training for specific skills you can be more creative. If you want to do an activity for scanning, you can put someone in the lifeguard chair, and another person behind them. Blindfold the lifeguard in the chair and have the person behind him throw objects into the pool. The lifeguard then has 20 seconds to scan and see if any object is on the bottom. What do you want to focus attention on? What skill? Can you isolate that skill? How can you stimulate that skill, or use that skill to accomplish something? Can you put a roadblock up that the skill might be useful in overcoming? Or by not using the skill you'd fail at? How do you use multiple people? when you are done, explain why you did everything. "We played the scanning and the blindfold and throwing game so you could see how difficult and important it is to scan using three-d triage. Remember, the bottom of the pool is the most dangerous because it is hardest to see and most fatal. #1: Be a positive voice in the child's life. #2: Teach young to survive when they fall in the water. These two goals permeate Teresa's lessons and shape how she crafts her lesson plans and determines her purpose. She mentioned that there was a point where each week they'd hear about four children dying in pools. Teresa's goal is to do all she can to stop drowning through fun effective instruction. How Oriental Trading can provide low-cost prizes to encourage learning and effort. My favorite parts of our conversation are where Teresa talks about updating her lesson plans and adjusting mid week for each child she works with. I'm also fond of her wealth of games and activities she reviews at the end. Episode 057 with Meighan Julbert: "Focus on the 2-3 things totally essential for swimmer's success." Episode 055 with Karis Mount: "My coaches focused on the one thing that would make me improve. We were focused." Episode 054 with Jennifer Butler: "When giving feedback, focus on the one thing that will help them the most." Break every move down into "chunks"
"This is your focus, this is your goal"
Strong direct immediate feedback: That ties into the focus, the goal. Avoid breaking bad habits, give new ones. Give effective feedback in your lessons or on your swim team. Meighan Julbert is a Mental Skills Consultant for The MindSide who brings a passion for understanding how to gain competitive advantages as part of early athletic experiences, through proper structure and coaching of athletes. As a former competitive athlete, Meighan understands the need for proper mental skills training from program implementation, instead of waiting until athletes feel it is needed. Meighan earned an undergraduate degree in Psychology from Auburn University, where she worked with the men’s basketball program, from coaches to athletes and administrative personnel. She went on to earn a Master’s in Science degree in Sports Psychology and Motor Behavior from the University of Tennessee, focusing on foundations for elite mental performance among athletes across the life span. During her time in Tennessee, Meighan worked with the men’s golf team. She also served as a coach for two girls teams for a local preparatory school, applying her training as a mental coach with that of serving as a coach to maximize performance and athletic development. Meighan is passionate about coaching development and program implementation, as well as developing the athlete’s competitive mindset. From her own experiences as a competitive athlete to serving as a coach to her educational background with the principles of human performance, Meighan will help those athletes who are looking to gain a mental edge. "Everything you do determines how well you're going to play." "Be prepared for the times you're going to struggle." Meighan talks about challenges and specifically how at practice physically and mentally is what helps you learn to compete. How we teach our beginners and our elite athletes should be "what is the mental state like at practice?" Meighan talks about how those small skill work and details that go into perfect swimming and perfect practice is never as fun or interesting as competition or racing. She suggests that we use fun challenging yet achievable tasks to build interest and excitement for those small detail repetitive activities. This ties perfectly into the last episode of the Swimming Ideas Podcast, Episode 056 where I talk about using challenges inside of lessons to reset mental interest. However, Meighan is suggesting that we use challenges to help teach those specific skills like streamlining. Maybe we add point values to successful streamlines and the lane with the most points at the end of a set get a reward. Add a layer of competition or difficulty to your activities to help boost engagement. We also talk about how failure and struggling are some of the best opportunities for an individual to learn. We review how we can allow it to happen in a trusting safe environment during practice and how the coach can handle failure during a swim meet. We look at praising the effort and Meighan gives us some guides on how to phrase our words for disappointed athletes. Praise the effort. Praise the mental preparation. Meighan talks about Michael Phelps and his struggle with water in his goggles. He used envisioning techniques to prepare for the possibility of a championship event and having water in his goggles. Pay attention to when Meighan talks about how as teachers we need to remember that our athletes are people first. That each individual athlete is at a different level and requires a unique approach. Our challenge, our difficulty as Aquatic Professionals is how do we keep those simple things entertaining and interesting? That is the primary goal of Swimming Ideas; how do we train our staff and our coaches to teach simple difficult specific swim techniques in a fun and effective way? Communicate early and often with the parents. Meighan mentions how the parents are extremely influential in their swimmer's success, and in the presence of a void (no coach or instructor communication), the parents will fill it with what they think is correct. They may be working against your plan and against your flow because they don't know any better. If instead, we set up a parent meeting at the beginning of a season, at the beginning of swim lessons we can fill in those gaps with information we want the parents to have and act on. We talk about how the coach's and instructor's voice should be present and consistent. We recommend that you engage your parents using the medium that they are most responsive to. Some audiences will be email focused, others will use facebook or twitter. Find the avenue that gets the most response and gets in front of the most eyes, and use it. Meighan suggests that you follow a regular pattern whether it is every week, two weeks, or monthly and stick to it. Provide consistent communication with your athletes and parents and you'll provide a cohesive directed teaching environment that will be reinforced by the parents. She said that if anyone has questions about anything we talked about or just wants to reach out you should. Go to Meighan's page and fill out the contact form. Are you in a rut? Have you taught the same lessons over and over for years? They work, they're great, and they're interesting for the kids, but how can you amuse yourself and your students without disrupting the flow of your tried and true lesson plans? Do a series of Challenges. Do a back float, roll over on your belly, then roll over on you back again. Or Front float, back float, front float roll. Put only your lips underwater and not your nose for 5 seconds. Stand on a noodle without touching the bottom and keeping your head above water for 10 seconds. A physically achievable activity that may not be easy to accomplish; some may fail and that's okay. Where does the concept come from? How have I used them in lessons recently? Why do I continue to use them? Will they show up in an updated lesson plan? Maybe. Karis Mount grew up in Minnesota, graduated high school in North Dakota, and is currently in school for Supervisory Management. She swam all 4 years of her high school seasons and was on varsity. She continues to swim at alumni meets. Karis taught swim lessons and was a Head Lifeguard at her local YMCA where she was involved in adaptive lessons and helped coach 5-9 year olds. One day she would like to run her own swim school. As you listen to Karis talk you'll pick up on her enthusiasm and excitement about swimming. She has some clear ideas on what she liked both as a swimmer (that the coaches did) and mentions three really important points. I like how Kari's gets in the water and is visual with everything. She demonstrate and shows before asking her swimmers to do something. In Karis' words: "Giving a swimmer too much information can overwhelm their brain. A good coach will encourage and help, not distract or make things more complicated and difficult. @48:00 We talk about how Karis progresses from a swimmer that can just go underwater to swimming freestyle. She follows a standard, glide off the wall, scoops, and floats with assistance. She recommends that you take your kids to the deep end in a safe manner, just to expose them to it early on. Put a noodle on them and expose them to the deeper water. One of my favorite tactics she shares is the "following the arms" activity. Following the arms: Your hand is the paintbrush. Tell the swimmers to "paint the ceiling and pick your favorite color. Then paint the ceiling with your hand as you move it over your head. Dip your brush in the water as you scoop, then paint the ceiling with your hands. And towards the end, we move into a list of really interesting swimming games. Get a 4" or 5" PVC pipe and hold it upright light a fireman's pole. Swimmers move hand over hand up and down the pool to get rings and toys from the bottom. Game penguin. @36 a team bonding game. Not included in the podcast audio, but in a follow-up conversation Karis suggested the Pool Petz bean floats as interesting and fun rewards for swimmers. Jennifer Butler of Roots Aquatics is awesome. She is an experienced preschool teacher, swimming veteran and expert swim instructor. Jenn is the Aquatic Coordinator at Roots Aquatics and Fitness Center where she trains lifeguards and swim instructors, teaches lessons, does the schedule, and writes a staff only blog. This summer she'll be running the camp swim lessons for all three Roots locations. Jennifer has taught swim lessons for 11 years and has had a lifetime of aquatic experience; swimming in middle schoo, high school, and college. She taught preschool for 7 years, and began her swim instruction at the YMCA where she blended American Red Cross and YMCA lessons into one. In this podcast we go in depth into the Roots Aquatics program and discuss things that Jenn and her staff do to engage their students. Otter Toddler Class: New class for Roots where they start by themselves at 2 1/2 if a teacher recommends them into the class. This fills a gap in their levels and lessons. The class is for kids that move on their own, or with floatation devices and have outgrown their "mom and tot" class, but aren't quite ready for the group lessons. @ 13:30 Free Swim Lesson: 3 month to 6 month. This is a brilliant idea that might be the next big thing in swimming lessons. Much like the current online website formula Jenn and Roots Aquatics are offering a free class that they hope will serve as a hook for their classes. It is limited in scope (3m - 6m) and when it is done well, the parents and kids will be motivated to stay with their program for the rest of their swimming career. In this class they read a book to the kids, and do an activity with each line in the book. One example is reading a book about a pig that is painting. They get a paintbrush and "paint" the kid's with the paint brushes in the water. Gives an activity that allows interaction and a doorway to going underwater and floating. Jenn employs the "shadowing" or apprenticeship mode of training where new hires will get in the water with a veteran instruction and learn how to teach in the classes. After about 40 hours of training, they gradually move into doing single skills under the guidance of the veteran instructor. At [time] Jenn goes into detail about some games that they play with books for their beginning level classes. We want to hear your story. What unique things do you do in your swim program that set you apart from the crowd? Every person has their own unique story facing the challenges and obstacles in their lives. What have you chosen to improve or develop that you're proud of?